Identifying different types of websites still remains to be a mystery to many. Throughout our consulting sessions we have learned that some confusions still exists amongst the business owners or even marketing and PR people who often play the role of educators to their clients. A lot of today’s successful websites are powered by software and developed by software developers and not by static pages published by web designers and web design companies. That might be the clue to why your last website project that was put together by your favorite design and marketing firm looked so visually stunning but failed to perform as it should have! Understanding the nature of your Internet project and knowing the evolutionary stage that it is standing in,Â will put you in the right direction in choosing the type of talents and teams that you will be involving with your next website project. 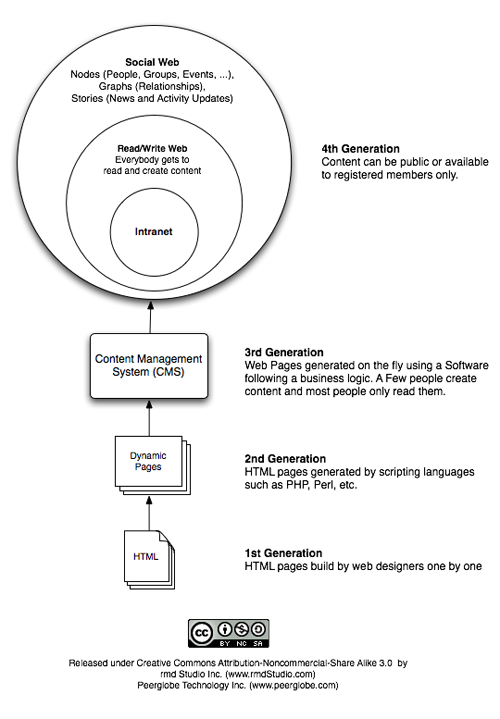 This diagram shows the evolution of Internet websites from static HTML pages all the way up to the social web. Charles Darwin would have been so proud of this!